PHILADELPHIA — Shortly after winning the college women’s distance medley relay Thursday in the Penn Relays, the Villanova runners were treated to a surprise. Handing them their championship watches were former Villanova track stars Vicki Huber and Michelle Bennett, both part of the Wildcats’ 1988 distance medley relay team that still holds the Penn Relays record. Villanova certainly has a proud tradition in the Penn Relays, a meet the Wildcats put a lot of emphasis on because of its proximity to their campus. The title Thursday was Villanova’s second straight and 12th overall. Spectators were prohibited from bringing backpacks or coolers into Franklin Field, and there were two fenced-in areas in the infield where athletes could keep bags that had already been checked at the entrance. The presence of additional law enforcement was also more visible outside the iconic football stadium located on the campus of the University of Pennsylvania. 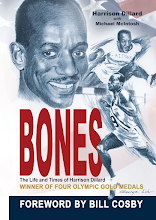 But one Penn official noted that lines to get in weren’t any longer than usual as many spectators and athletes heeded the advice that was given and arrived early to Franklin Field. 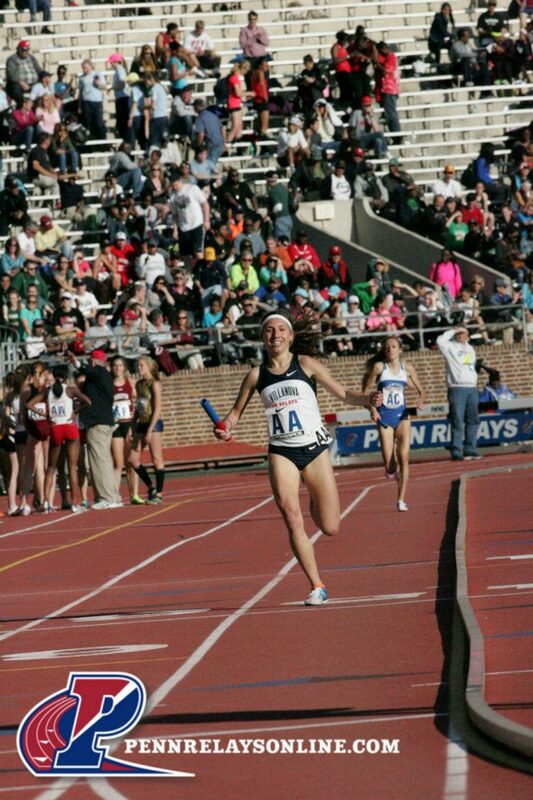 And the 23,310 fans in attendance — the 10th best Thursday crowd in Penn Relays history — were treated to a full day of high school and college events, highlighted by Villanova’s win in the women’s DMR. The Wildcats led for most of the race, thanks to a strong opening leg from Piccirillo, who has had a lot of success at Penn Relays. 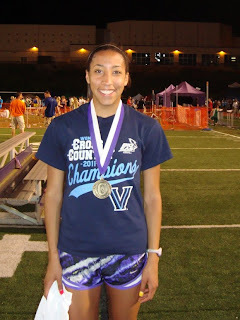 The Villanova freshman won two championships in the mile while at Homer-Center (Pa.) High School. “I’ve definitely had good luck here,” Piccirillo said. “This track has been really good to me.” Morganne Phillips briefly gave Kentucky the lead after completing the 400 in 53.3 seconds, but Akande took it right back with a big run in the 800. 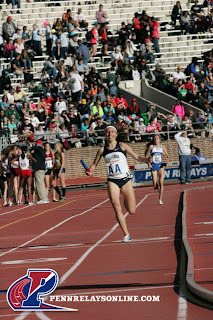 It was the second straight year that Akande came from behind to put Villanova in the lead heading into the anchor leg. The only difference is that last year she handed the baton to Sheila Reid, one of the greatest runners in Villanova history. Reid, who represented Canada at the 2012 Summer Olympics, graduated last year. Lipari, who ran the leadoff leg in last year’s DMR-winning team, held on to the comfortable lead and wasn’t threatened at all in her four laps around the track. The junior later said that she was a little disappointed that Michigan — which ran the season’s fastest DMR time to edge Villanova in the NCAA indoor championship — pulled out of the event to focus on other races. But that didn’t make Villanova’s accomplishment any less special. Other winners on Thursday included Penn State’s Laura Loht, who captured the college women’s javelin title at 154 feet, 8 inches. . 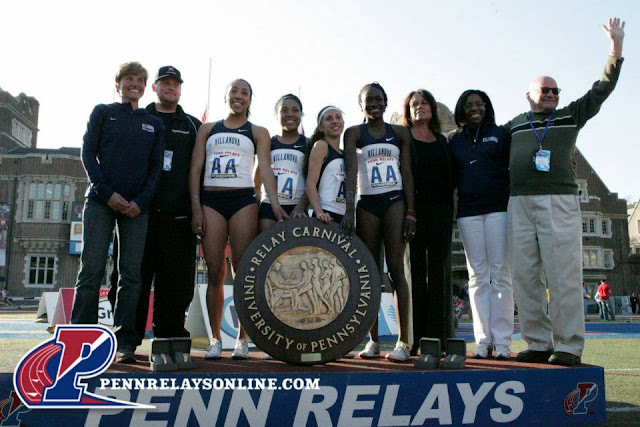 It was the fourth straight year a Penn State athlete won the event. Ramapo’s Michelle Favre won the college women’s pole vault at 13-5 1/4. Connecticut’s Victoria Flowers won the college women’s hammer throw at 210-7, Texas A&M’s LaQue Moen-Davis won the college women’s long jump 21-2 1/2 and North Carolina’s State Tremanisha Taylor won the college women’s shot put at 53-11 3/4. Eastern Kentucky’s Ole Hesselbjerg took the college men’s steeplechase title in 8:47.52.